When it comes to remodeling your old and outdated bathroom there is 3 main ways you can go about it. Complete replacement, tub and tile refinishing, and remodeling with custom bath sleeves. All three have their advantages and disadvantages and for the sake of comparison we are going to rule out complete replacement. When considering remodeling your bathroom there are several options that you can choose depending on your budget. Our recommended solution is to refinish and reglaze the existing ceramic tub, sink, or tile to restore the surface finish. This can extend the lifespan of your existing bathtub or tile by decades when properly taken care of, and can even help you completely transform your bathroom. Refinishing your existing bathtub can save you money because there is no need for the labor costs of demolition that typically occur with replacing a bathtub for a remodel. In addition to this, we can customize the color of your refinished tub and tile to match your preferences. All of this can be done for less than it would cost to have the bathtub replaced or a custom sleeve manufactured for your tub. Systems like these are custom designed sleeves that are made to insert in place over the existing tub. These systems are popular because they offer the homeowner the ability to customize their existing bath and surround. However, they can cost more due to the time involved in designing a custom sleeve that will properly fit over the tub. This is similar to the cost incurred when removing the old tub for replacement. 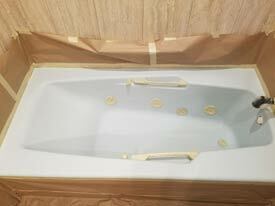 Choosing our team to refinish and reglaze your bathtub can help extend the lifespan of your bathtub. Modern remodeling systems like the bathtub liner system are designed and custom made to fit your tub. However, the lifespan of those systems is often less than it could be if you refinished the existing tub. Refinishing completely removes the old finish and replaces it with a brand new one. What this means for you is that your bathtub is essentially new. Our sealer and reglazing processes create a strong coating on the bathtub and tile surround that acts to protect the surface, just like a freshly glazed ceramic tub. If you have noticed damage, chips, cracks, or holes in your bathtub or tile you should contact our experts. We can schedule an appointment for an initial inspection and repair estimate that will help you get on track with your bathroom updates quickly. Contact our experts online or by calling 314-607-4611 today to schedule a bathtub or tile refinishing appointment.